The next lecture in Bournemouth University’s popular inaugural lecture series will take audiences on a tour through the history of animation to its modern day uses. Computer animation merges an appealing form of art with innovations in computing technologies, creating visual pieces and stories beyond our day-to-day experiences and inspiring generations. 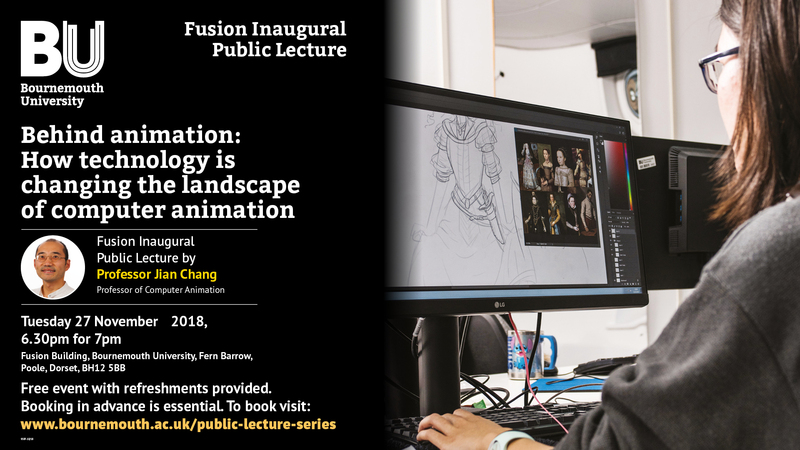 In this inaugural lecture, Professor Jian Chang, Professor of Computer Animation at Bournemouth University will give an introduction of the history of computer animation and related technologies, illustrating how this has developed to the present. He will then look at what the future holds and the ways in which technology is evolving and changing our definition, production and consumption of computer animation. Professor Chang is part of BU’s National Centre for Computer Animation which has been a pioneering force in the establishment of computer animation as a discipline for 30 years. Through its teaching and research, NCCA blends together technical developments in computer animation with artistic principles and practice. Students have gone on to work on internationally renowned films such as Gravity, Interstellar and Ex-Machina. Professor Chang’s lecture will take place at 7pm, 27 November on Talbot Campus. Doors will be open from 6:30pm. Free tickets can be booked here.